Firstly, apologies that I haven’t been posting as regularly here the last couple of months. With a bit of luck this will be the beginning of getting back to the ten posts a month point I was at last year. Anyway in my absence the blog’s email account has still been getting hit with a trickle of reader queries, and since a number of them have been making a similar point I’ll tackle it in one post. Basically these are from younger investors who want to know whether the likes of Coca-Cola, PepsiCo, Procter & Gamble and other popular dividend compounders can match their historical returns. Firstly let me say that as a younger investor myself that it’s something I think about a lot. We like these names in the first place because they’re great business with equally great historical returns, but we worry that lower growth will lead to sub-par returns in the future. On financial media sites like Seeking Alpha you’ll tend to read a lot of the following in the comments section: “Go for growth when you’re young and switch to the stodgier names when you’re older”. Sounds logical, and we’d all be on easy street if only life were so simple. To get a grip on the solution to this issue let’s first consider why all these old names outperformed in the first place. I’ll use Coca-Cola as the all encompassing example but you can swap it for a bunch of your favorite dividend and dividend growth stocks because the principle is universal. 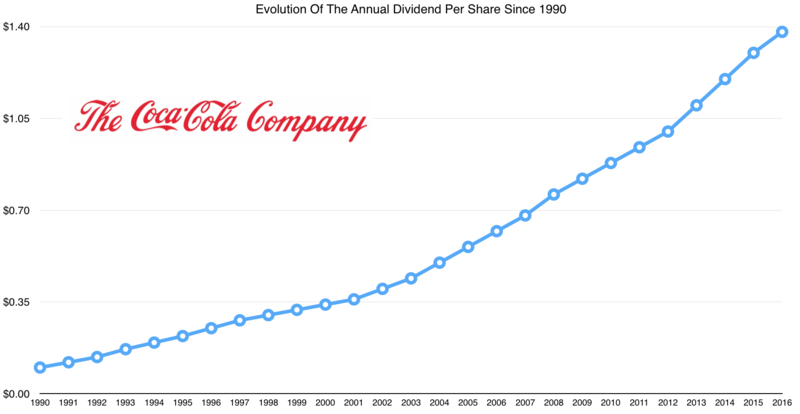 Over the past couple of decades Coca-Cola stock has returned just 4.1% a year if you include reinvested dividends. It’s beats inflation, but not by much. You’ll know that I’ve written about this before, and that Coke in the late 1990s had a big valuation problem. How big? Well if you consider that the business has posted dividend per share growth of 8.3% per annum since 1997 then you can see it’s pretty huge. If Coca-Cola stock had been at 24x prior year earnings at the start of 1997 – which is the valuation applied to the stock today – then annual returns would have roughly matched the S&P 500. Put another way the business performance of Coca-Cola has actually not been all that bad during that time. Now this is obvious a case of extreme, rather than mild, overvaluation. Coke’s dividend yield at the start of 1997 was just 1%. The thing is that for a huge chunks of Coca-Cola’s history it was materially undervalued, even if it wouldn’t have seemed obvious at the time. At the start of 1990, for example, Coca-Cola was yielding a 1.7% dividend and trading at 17.8x annual earnings. That sounds like a reasonable entry point, but it doesn’t exactly scream value at you. It just sounds about what you’d expect it to be. Between then and now though Coke has managed to grow its per share distribution at an inflation destroying rate of 10.6% per annum. Clearly Coca-Cola was undervalued back then, with the market simply not anticipating the compounding machine of its underlying business. Now apply that principle going back even earlier still. What about since 1980? Well, Coca-Cola has increased its dividend at a compound annual rate of 10% since then. Since 1970? The figure is about 10.35% a year. You can keep going back as far as you’d like and see the same thing (remember Coca-Cola has been paying and compounding its dividend every year since around 1920). Another good example is that of Hershey stock. Two decades ago shares in the US chocolate maker were trading at around 23.5x annual earnings with a dividend yield of something like 1.6%. Once again it certainly wouldn’t have appeared particularly cheap to investors at time, yet between then and now Hershey has managed to increase its dividend per share at a compound rate of 9.1% per annum. Total compound annual returns, including reinvesting dividends along the way, have worked out to 9.8% compared to 7.5% for the S&P 500. Despite not appearing cheap at all it was clearly a decent bargain for those prepared to stick around for a long enough period of time. Once again the market seemingly didn’t appreciate Hershey’s long-term compounding ability. The other point worth mentioning here is that the longer you hold the less importance the starting value multiple will have. This is why it’s never quibbling about when shares of this quality are trading at a slight premium to their historical average. Over a ten-year horizon a downwards revision from, let’s say, 20x earnings to 15x earnings will equal a hit of around 3% a year to your total returns assuming a 7% rate of earnings growth. In other words you’d “lose” 4% a year due to overpaying. Over a thirty-year period this loss would reduce to about 1% a year. Don’t get me wrong, over such a long period of time that’s going to add up to a lot of very real “lost” dollars, but it’s not the end of the world either. To put it simply in the long-run it’s business performance that counts and what makes up the bulk of total returns. As Benjamin Graham put it: “In the short run, the market is a voting machine but in the long run, it is a weighing machine”. The key question, therefore, is can Coca-Cola and other habitual compounders do in the future what they have done in the past? This would require the two things set out above: i.e. maintain their unusually large moats which are the foundation of their quality earnings and be able to grow them at a rate above that implied by the market. The two aren’t completely unconnected of course. The former lays the path for things like sustainable share buybacks, paying down debt and funding acquisitions and expansion. All of those things are earnings enhancing. On that score I think there’s reason to be optimistic. In the case of Coke (and many others) its sustainably high returns on capital and freakish cash generation come from the power of its brands; twenty of which are doing over a billion dollars a year in sales. The compounding machine will continue to be intact for a long time to come. On the growth front investors have naturally been a bit disappointed. A bunch of the old guard names generate a significant proportion of their sales overseas; a situation which has meant lower earnings due to a strong dollar over the past few years. As a result Coca-Cola’s dividend is now taking up as much as 90% of net earnings per share. The stock is yielding 3.3% based on its 2016 full year dividend. As far as I can tell the highest it has averaged in a single year since 2000 was 3.4% in 2009. Despite the general gloomy looking outlook I’m slightly more optimistic. Eventually the strong dollar headwind will change into a weak dollar tailwind. Remember as well that the higher yield also means less growth required to generate as long as you’re plowing it back in for more shares. Most of the high quality dividend stocks are indeed fairly expensive, but if history is anything to go by then it would foolish to write them off assuming you’re in it for the long haul.